Uglyworld #647 - Singing In The Rain (195-365), originally uploaded by www.bazpics.com. With the weather here in Aachen having been up in the 30-40 degree centigrade range for the last couple of weeks things started to cool down in dramatic fashion here this evening, kicking off with lots of thunder and lightning followed by some of the heaviest rain I've seen since moving out to Germany 3 years ago (and anyone who knows Aachen knows that it rains A LOT here!!!). 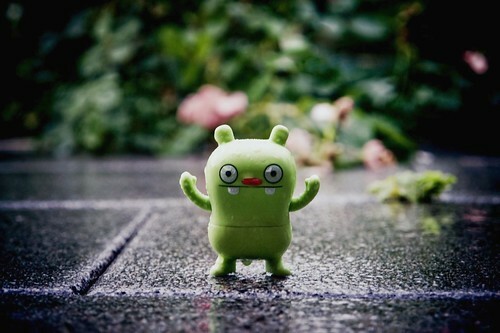 Jeero made full use of the downpour this evening to get himself cooled down, as he stood in the pouring rain shouting, "Come ons you guys, it's awesomes, reallys! ", followed by some verses of the classic tune, "singing in the rain". The rest of the guys were smart enough to just stand at the door and watch Jeero get absolutely soaked, as the cooling winds blew right in their faces that way without having to get wet. Eventually Jeero marched back in and shook all the rain off and stated, "You guys don'ts know what you misses outs on, that was amazings!". It probably was Jeero, but at least we all stayed dry while still managing to cool ourselves down.